Rivergate is a 55+ community in Little River, South Carolina. This coastal neighborhood provides residents with a low-maintenance lifestyle and charming amenities. With only 82 homes, residents enjoy a small-town vibe and friendly environment where it's easy to meet new neighbors. 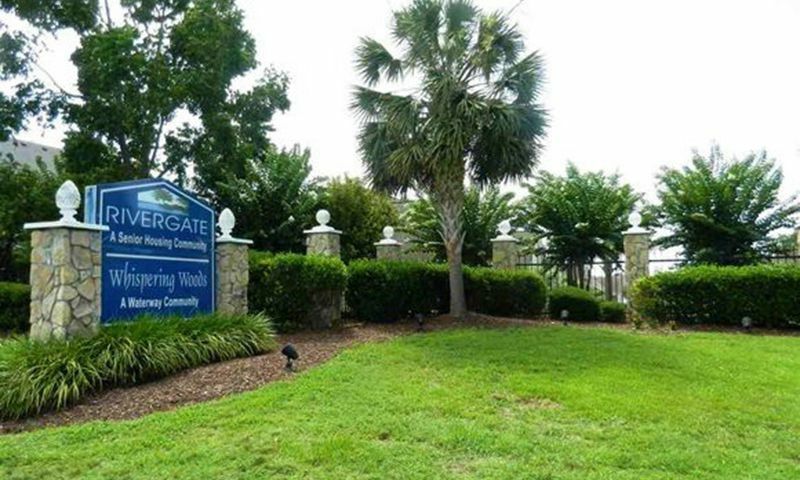 Homeowners also enjoy Rivergate's prime location within the Myrtle Beach area where they can access major roads, daily conveniences, beaches, and attractions. Residents gather for social activities and events at Rivergate's clubhouse. Here, they can be as active as they wish. Neighbors can get together in the lounge for casual conversations or prepare a meal in the catering kitchen. The outdoor pool and patio are great spaces for homeowners to get some sun and fresh air. Rivergate was developed between 2001 and 2009 and consists of just 82 residences. Rivergate offers charming maintenance-free homes that range in size from approximately 1,200 to 1,900 square feet. These attached residences have two or three bedrooms, two or two-and-a-half bathrooms, and an attached one or two-car garage. They feature open layouts, vaulted ceilings, walk-in closets, and inviting living spaces. Homebuyers who want more space and privacy can choose from a great selection of resale single-family homes. These detached residences offer about 1,297 to 1,992 square feet with three or four bedrooms, two to three bathrooms, and an attached two-car garage. Single-family homes may include upgrades like twin master suites, granite countertops, wood floors, ceramic tile floors in bathrooms, storm doors, and private patios. Rivergate provides active adults with a low-maintenance lifestyle where an established homeowners' association (HOA) takes care of tedious exterior home chores. An affordable monthly HOA fee includes trash removal, lawn maintenance, and cable TV. Residents have more time to pursue individual interests or hobbies at their leisure. They can hang out in the clubhouse, mingle with neighbors, or explore all that the Myrtle Beach area has to offer. Located in Little River, South Carolina, Rivergate enjoys a convenient location close to beaches, shopping, dining, and attractions. Highway 17 is just outside of the community's entrance so driving around town is a breeze. Homeowners are surrounded with great attractions and entertainment like the Intracoastal Waterway, North Myrtle Beach Fishing Charters, Harbor View Golf Course, and The Valley at Eastport Golf Club. Restaurants, bars, retail shops, a bank, CVS Pharmacy, and post office are just a few minutes away. Residents will love having easy access to miles of shoreline along the Atlantic Coast and plenty of beaches for fun in the sand and sun. For additional entertainment, active adults can drive to Myrtle Beach in about 30 minutes. They can also catch a flight out of Myrtle Beach International Airport. Rivergate is a charming 55+ community with plenty to offer active adult homebuyers in South Carolina. Check back soon for more information on the lifestyle in Rivergate. Rivergate offers charming maintenance-free homes that range in size from approximately 1,200 to 1,900 square feet. These attached residences have two or three bedrooms, two or two-and-a-half bathrooms, and an attached one or two-car garage. They feature open layouts, vaulted ceilings, walk-in closets, and inviting living spaces. Please Note: Floor plans are not available at this time. Rivergate also offers single-family homes. These residences have two or three bedrooms, two or two-and-a-half bathrooms, and an attached one or two-car garage. They feature open layouts, vaulted ceilings, walk-in closets, and inviting living spaces. Please Note: Floor plans are not available at this time. 55places.com is not affiliated with the developer(s) or homeowners association of Rivergate. The information you submit is distributed to a 55places.com Partner Agent, who is a licensed real estate agent. The information regarding Rivergate has not been verified or approved by the developer or homeowners association. Please verify all information prior to purchasing. 55places.com is not responsible for any errors regarding the information displayed on this website.